UFW Stories: "Just one of many stories." "Just one of many stories." I worked for the UFW from ‘93 - 94, and then again from ‘95 - ‘96. My aunt Ailsa ran the print shop in La Paz, and I joined her team of print jockeys. We put together the fundraising mailings, printed posters, leaflets, flyers, designed t-shirts, and pressed buttons. Later on I moved “inside” to do graphic design, typesetting, and stripping negatives in the pre-press department. I loved it. 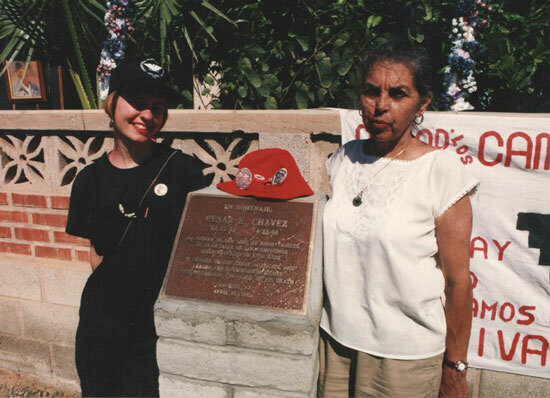 One of the first things I did as a staff member of the UFW was attend a funeral of a farm worker in Delano. We all piled into cars early in the morning and drove to a graveyard in northern Kern County to pay our respects. I didn’t know the family, and hadn’t been to many funerals, but I knew solidarity. It’s just the right thing to do. Over the years, my main job remained in the print shop and communications department, but we also did what was needed, when it was needed. We marched on dusty San Joaquin roads and on the city streets of LA and San Francisco, walked picket lines, leafleted in tiny worker towns up and down the valley, went door-to-door doing GOTV, and we worked the boycott. I remember the great dinner celebration we all had on March 31, 1993. Of course we didn’t know it then, but it was Cesar’s last birthday dinner. Early that morning, everyone got up before dawn to sign ‘Las Mañanitas’ at Cesar’s window, and then feast on pan dulce and chocolate. Little did we know we were singing to an empty room, because Cesar was already awake and on the go. He rose early and worked hard. Later that day, Helen cooked up an incredible vegetarian Indian meal, and everyone in La Paz celebrated Cesar’s 66th with him. It was a special time. The union influenced everything in my life. My career path started there, and I met many close friends and mentors there. La Paz will always feel like a home to me.